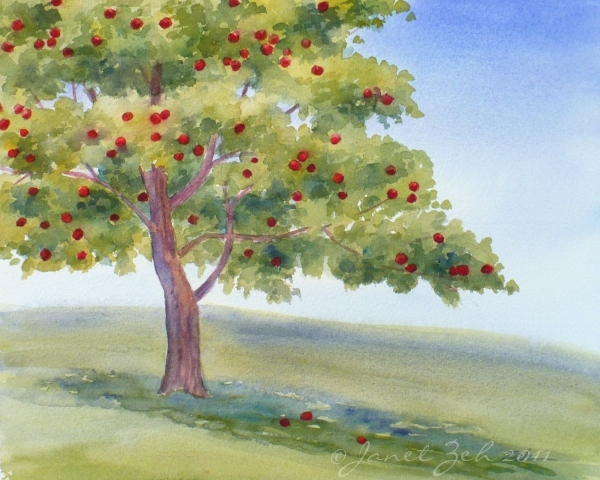 The apples are red and ripe in this 8"x10" watercolor of an apple tree in a field. It's that time of year again to go apple picking. Just think of coming home with bushels of delicious, crisp, juicy fruit to make apple pie, applesauce, apple cake...and eat apples just as they are straight from the tree! In any case, that must be what has inspired me to paint this piece.Thanks for stopping by. I hope you have some yummy apples to pick where you are. The original painting is sold, but you can contact me if you would like to order a print.